Dr. Robert Rodriguez is a highly respected and sought after thought leader in the area of diversity and inclusion. His column in Diversity Executive Magazine is read and referenced by numerous diversity leaders because of his provocative comments and views on the next generation of diversity leadership. Many consider Dr. Rodriguez to be the leading expert on Latino diversity in corporate America and his book, "Latino Talent: Effective Strategies to Recruit, Retain & Develop Hispanic Professionals" has provided a framework for dozens of Fortune 100 companies looking to enhance their Latino diversity initiatives. He is a frequent speaker at diversity conferences and often presents to senior executives regarding the business case for diversity. His passion however involves speaking with diverse professionals on how to leverage their uniqueness and ethnicity as a source of strength and as an asset in the workplace. He currently serves on the board of directors for several non-profit organizations and is the Director of the Center for Corporate Learning at Kaplan University. His doctorate is in Organization Development and he is a graduate of the Latino Leadership Institute at UCLA. 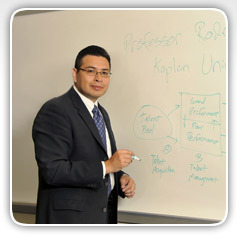 Dr. Rodriguez and his family reside in Chicago, IL and he can be reached at Rrodriguez2@kaplan.edu. Copyright 2011 Center for Innovation & Humanity All rights reserved.